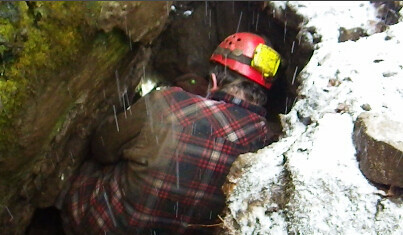 Cave Shaft at Twin Trickles – exploring rocks and minerals from within (Bancroft), originally uploaded by Mic2006. In the Fall 1998 edition of the Canadian Caver, Brad Wilson relates an interesting experience that he had while exploring a remote cave in the Canadian Shield. He says that he could see a small room beyond a horribly tight squeeze so instead of going face forwards like he would normally do, he went feet first and after a little struggling he suddenly slipped through into a tube – chest deep into icy water. As Brad points out, to have gone head first would likely have been the end of him. Exploring the rock from within, as we did at Twin Trickles Cave was certainly an amazing experience. 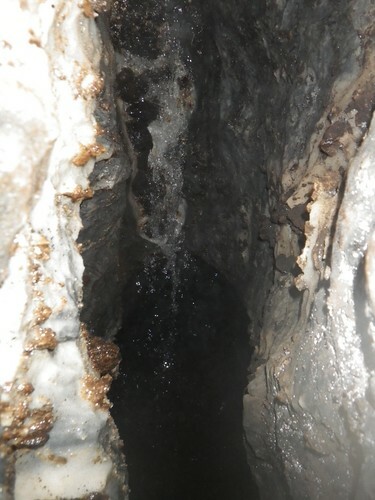 The marble and calcite was incredibly sculpted and at the bottom of the shaft pictured above, there was a room that was bowl-like, and entirely striped black and white by the surrounding rock. When I mention a cave in the same sentence that I mention Bancroft, I do not for an instant suggest that it is a site for rock and mineral collecting. Caves are natural wonders that have been thousands of years in the making. They should be left exactly as they are found. Check out this video documentary of exploring rock and minerals from within (Bancroft) here. Twin Trickles Cave is some short distance into the forest and on the day that we visited, it was horribly inundated with ferocious black flies – food for the bats that reside within. although Twin Trickles is not a large cave, the rooms are sizeable for Ontario and there is a long tubular tunnel that seems not to have been followed either by ourselves or Brad’s group in 1987 – obviously it is no easy task and it dips down toward the water table. There are plenty of unprobed leads in the area of Twin Trickles so there will be more trips up in that direction this coming summer. 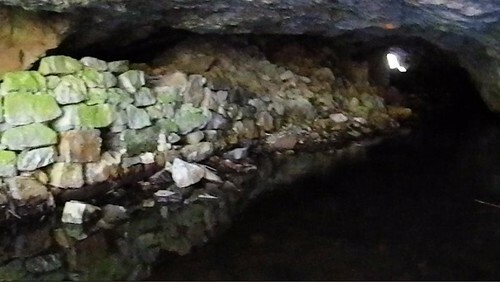 The Newt of ‘Noot’s Nook’ – Cave Wildlife in Ontario, originally uploaded by Mic2006. It’s hard to imagine how thrilling it was to see this wonderful yellow spotted newt. 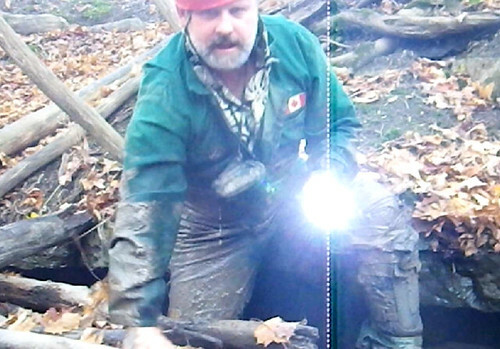 He crawled out from beneath a rock as we were digging in Newt’s Nook, a local cave near Toronto (Ontario). 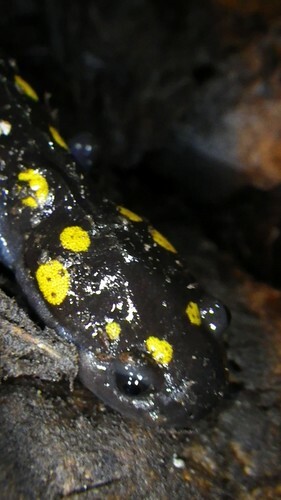 Newt’s have both a terrestrial and aquatic phase to their life, they hatch from eggs at a length of about 1 centimeter and they exist on land, hiding beneath leaves and old logs. Officially a young land-dwelling newt is referred to as an ‘eft’. After about 3 years the eft moves into a swamp to continue the remainder of its life (about 10 years), flippering about in the mud and slime. I am thinking that maybe the yellow spots have something to do with warning other animals to stay away. I understand there are toxins in the newt’s skin that make them poisonous to everything but a garter snake. Apparently there is a ploy whereby a beleaguered newt flops over onto it’s back to display a belly that reddens in proportion to its anxiety – another form of warning. Once transplanted from the spot beneath the rock that we found it, the newt blinked myopically and then began dragging its feet in a slow but persistent dash for the nearest crevice. See this documentary video of our dig at Noot’s Nook and the discovery of the above pictured creature – here. 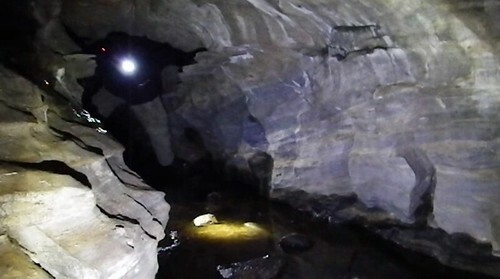 Our intention is to return to Noot’s Nook and continue following downward toward tunnels that appear to exist about 3 feet beneath the solid base of the cavern in which we found the newt. It is possible to see the space below through a narrow crevice. However great our excitement, we must exercise care as safety is paramount on any dig – especially where there is so much loose rock.